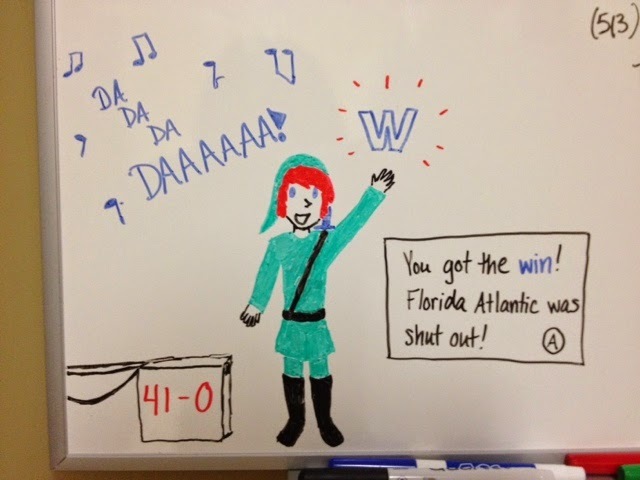 One of my roommates likes the Legend of Zelda franchise and she went home for the weekend, so I did a little art on our whiteboard to let her know how the football game went. Because I'm just silly like that. I mean absolutely zero offense to any Florida Atlantic fans who might be reading this, by the way. Thanks for coming out yesterday, and I'm sorry you had to sit through intense heat and then a sudden downpour. That was kinda awful. this picture is very funny, I can see your desperate spirit in this. visit out site to improve you language skills. Pretty good post! I just stumbled upon your blog and wanted to say that I have really enjoyed reading your blog posts. Any way I'll be college-paper-writing.com subscribing to your feed and I hope you post again soon.